This purge the comments.php immense. But it might be a disadvantage for theme authors, since they hardly have the possibility to change the output of comments. And that WordPress developers having their own vision of HTML and CSS is a common knowledge. Right now, we have to wait and see, since it's an early version. It will be interesting how this develops. I'm not so sure this is going to be a negative thing, but man am I having a difficult time understanding how to fully style the comments now. Its not like we can just edit a class in CSS now. There's more to it and its a little frustrating right now. Oh well. I really need to see how the comment data is spit out to the template so I can add certain things for my plugins. I hope something more comes out soon! Hey Dan and Andy, we surely will provide helpful posts on this subject in the near future. Stay tuned. I have written a post about moving Reply button in the WordPress comment thread, from the beginning of the thread to the end of the thread. The goal of this action is to make it easier for the readers when replying comment-thread. I am using arthemia theme for my blog and it does not show reply link to comments. I have added the required code for reply button below comments. Infact wp_list_comments() is not there in comments template of arthemia free theme and I use wordpress 3.0.1. 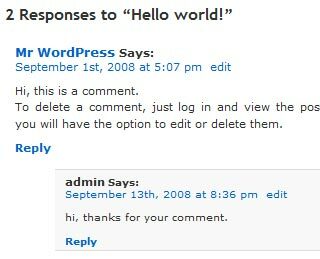 So for some themes comments code needs to be altered although one uses the latest wordpress version.